In the small Lake Erie township of Benning, someone is at work cultivating a supernatural garden . . . Elsewhere, police officer Heather Gerisch responds to a late-night breaking and entering in one of the poorest homes in town. She soon realizes that the masked prowler has left thousands of dollars in gift cards from a local grocery store. As the bizarre break-ins continue and Heather pursues the elusive "Summer Santa," Andy and Rip discover an enormous and well-kept garden of wildflowers that seems to have grown overnight at an abandoned steel mill. My thoughts: I loved it. Some things were a little predictable, but I had a hard time figuring out exactly HOW those things would occur, or how the characters would figure it out. Other plot twists threw me for a loop. And some had me thinking one thing in one chapter, another thing a couple chapters later, yet another another chapter further on, and then back to a combination of "idea 1" and "idea 2" -- only to find out that I was off track most of the book. I like that in a mystery type of book, not that this is exactly a mystery. I like being spot-on sometimes, completely off track on others, and continually guessing with parts of it too. The characters -- especially the men -- are well-written, and well-rounded. Unlike many of the books I end up reading, very few are described in a bunch of detail physically, though you know Rip is pretty muscular, Andy's face is scarred, and Chloe is beautiful, inside and out. Mostly, though, everyone just seems like normal, flawed, imperfect people. I love books that have characters who aren't perfect. There is a supernatural aspect to this, with things like the flowers and the messages through the broken iPod, which I thought was fun. Loved the book, and I'll look for more by William Sirls. Meet William Sirls: Once a senior vice president in a large investment firm, he was incarcerated in 2007 for wire fraud and money laundering. Life lessons involving faith, grace, and forgiveness are evident in his writing. 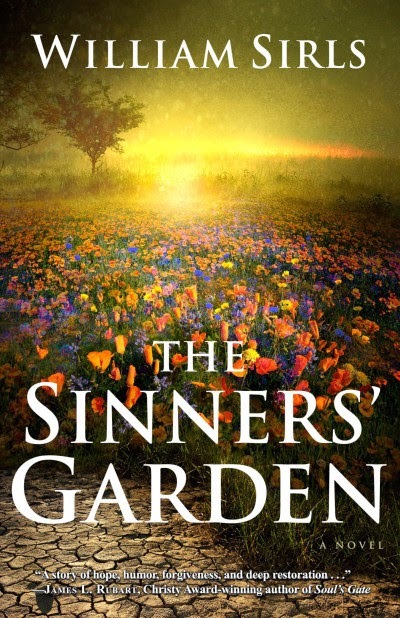 The Sinners’ Garden is his second novel. William is celebrating the book's release with an iPad giveaway.